Learn more about the satellite technology behind FishTrack with this handy glossary.. 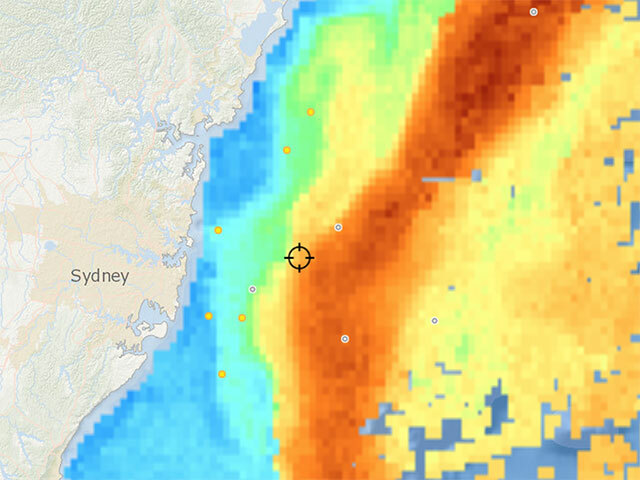 This zoomed-in screenshot of a FishTrack AHVRR SST image shows the East Australian Current off the coast of New South Wales in Australia. These satellite-derived sea surface temperature charts are updated multiple times each day and available to FishTrack Premium subscribers. This FishTrack VIIRS chlorophyll chart indicates water clarity along the Mid-Atlantic canyons and Continental Shelf. Multiple daily chlorophyll shots from both the VIIRS and MODIS satellites are available to FishTrack subscribers. The toolbars of the FishTrack online fishing tool (left) and iOS app (right) allow you to choose from the latest satellite charts and add overlays like sea surface height, currents and points of interest. You can also pull up a Buoyweather marine forecast and view tides for your area. 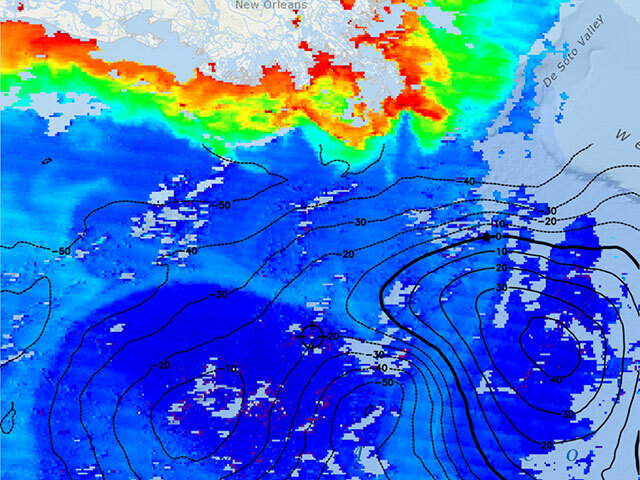 This chlorophyll shot of the central Gulf of Mexico shows the sea surface height overlay in action. Use this altimetry data to find areas of upwelling, downwelling and the convergence zones in between that often hold fish. View ocean currents as an overlay to find major current edges and eddies offshore. Learn the language and you'll reduce the learning curve. Understanding the key terminology associated with FishTrack's fishing tools will help you get the most out of the service and put you on the path to catch more fish. This handy glossary should serve as a good overview, but when you’re ready to dive in a bit deeper, FishTrack also offers Video Tutorials, a Beginner’s Guide to Using Satellite Imagery and a deeper look into understanding specific subjects like Altimetry. Be sure to check out all of FishTrack’s online resources when you’re ready to harness the power of satellite charts for fishing. If you still have questions, feel free to contact us anytime for more support at support@fishtrack.com. Short for Advanced Very High Resolution Radiometer, the AHVRR sensor is carried aboard a number of orbiting satellites and captures real-time imagery of the ocean’s surface. This includes multiple sea surface temperature shots per day, which are available to FishTrack Premium users. The number of shots available may vary depending on which region you are viewing. Measured by orbiting satellites, Altimetry data indicates the ocean surface height in relation to mean sea level in centimeters. By studying the latest altimetry imagery you can locate areas of upwelling and downwelling and the location of ocean current features and eddies. Altimetry data can be overlaid on any FishTrack satellite chart, and is updated once a day. Learn more about altimetry here. FishTrack’s Bathymetry overlay shows a relief image of the ocean’s floor. Bathymetry data can be overlaid on any SST or chlorophyll chart to easily determine the location of temperature and color breaks in relation to undersea structure like canyons, shelf edges and seamounts. A sister site to FishTrack, Buoyweather.com initially launched more than 15 years ago and provides point-based marine forecasts across the globe. 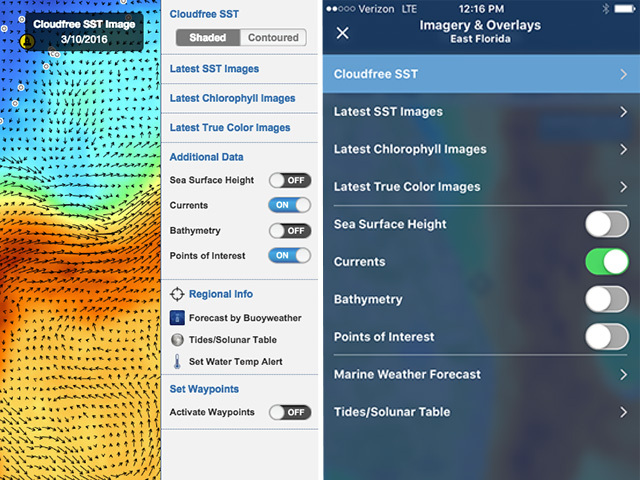 FishTrack Premium members are able to view a seven-day Buoyweather marine forecast, including wind and wave graphs, within the FishTrack web-based tool and iOS app. Chlorophyll is produced by plankton, and chlorophyll imagery is obtained from satellites and helps anglers determine the location of blue water versus dirty water. The data from the satellites is processed to display relative Chlorophyll concentrations. Knowing where phytoplankton blooms are concentrated can be an excellent indication of where baitfish should be concentrated. The boundary areas between blue and green water, often referred to as color breaks, will typically stack up bait and hold above-average numbers of predatory game fish. FishTrack offers Coudfree SST imagery, which is produced using data from a number of satellite SST sources with the help of computer modeling to fill in areas blocked by cloud cover. This imagery can be useful when persistent cloud cover obscures real-time SST satellite imagery. This data is updated once per day on the Fishtrack site as well as the iOS app. Anyone can access FishTrack's Cloudfree SST data for free. 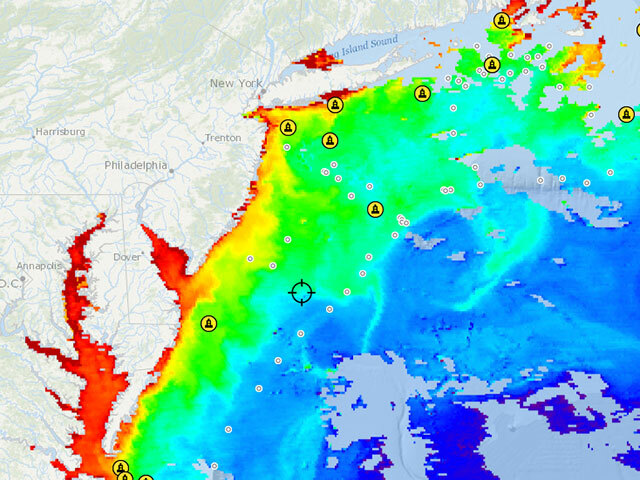 Ocean current models are available to FishTrack Premium users and can be overlaid onto SST and chlorophyll charts to help pinpoint where eddies and current edges intersect with color and temperature breaks. Current models are updated once per day, and high-resolution current models (available in some regions) also offer current velocity readouts. Short for Moderate Resolution Imaging Spectroradiometer, the MODIS sensor is carried aboard the Terra and Aqua orbiting satellites and captures real-time imagery of the Earth’s surface. 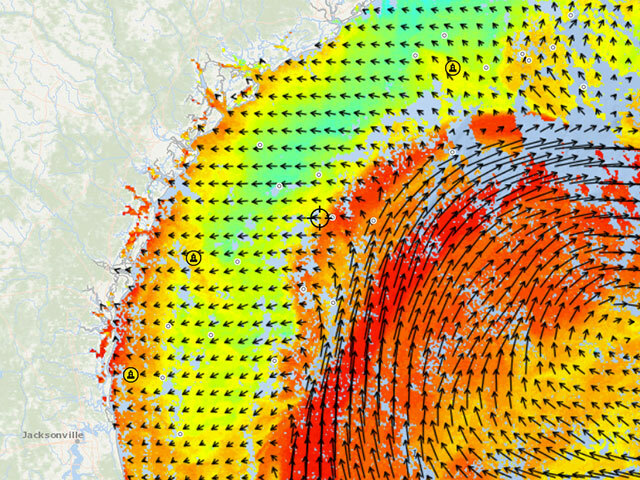 FishTrack offers both MODIS sea surface temperature, chlorophyll and True Color imagery to FishTrack Premium users. Multiple daily MODIS images are available but the number can vary depending on the region. FishTrack offers a number of Overlays, including Sea Surface Height (Altimetry), Currents, Bathymetry and Points of Interest, which can be viewed on top of any SST, Chlorophyll or True-Color image. The ability to view two separate sets of data together will often make the difference when pinpointing fishy areas. Available as an overlay, Points of Interest show the locations of key canyons, reefs, FADs, oil rigs, banks, mounts and other undersea structure. You can also see the location of weather buoys and view current conditions. Sea Surface Temperature, Chlorophyll concentrations, True-Color Images and Altimetry are remotely sensed by various orbiting satellites. After the data is retrieved and processed, FishTrack displays them on a base map and includes Lat/Lon readouts and depth, allowing you to pinpoint potential bite zones where game fish lurk. You can also adjust color and temperature ranges on imagery to further highlight breaks. Studying sea surface temperatures before you leave the dock can definitely give you the upper hand when headed offshore. Certain species will be found in certain ranges of water temperatures, while others are drawn to temperature breaks where bodies of cooler water meet warmer water. Solunar Theory postulates that times of increased fish activity are significantly influenced by the sun, moon and tides. You can view Solunar Tables for any area in the FishTrack fishing tool, and see detailed moon phase information, major and minor feeding times, and an index rating for each day's fishing. Tides are of paramount importance to anglers, especially those fishing close to shore. You can view tide predictions for any point in your region on the FishTrack site and iOS app. This “photograph” of the Earth’s land and ocean surface is collected multiple times per day and available to FishTrack Premium users. In addition to being very helpful in identifying Chlorophyll breaks, True-Color Imagery can also be used to identify areas of sediment-filled water around river mouths or shallow nearshore sandbars. An upwelling is a phenomenon where water from the deep ocean rises to the surface. This cold, deep ocean water is densely packed with nutrients and when it rises to the surface and is hit by sunlight, microscopic plants (phytoplankton) and animals (zooplankton) are able to grow quickly. Squid and baitfish feed on these microscopic animals, and in-turn attract larger pelagic species. Areas of upwelling are measured by Altimetry. Short for Visible Infrared Imaging Radiometer Suite, the VIIRS instrument lives aboard orbiting satellites and measures ocean temperature and color. This latest addition to the FishTrack imagery suite compliments the MODIS and AVHRR satellite data and provides high-resolution Sea Surface Temperature and Chlorophyll charts. FishTrack allows users the ability to set water temperature alerts for any point in the ocean. FishTrack will send you an email when water temperatures reach a preset value. This is especially valuable during early- and late-season fishing when you are waiting for the water temp to hit the preferred range of your favorite species. The FishTrack fishing tool allows you to set waypoints on a map and create routes between your home port and areas offshore that look to be holding fish. After a set of waypoints is created, you’ll be able to view Lat/Lon information, heading and distances. You’ll then be able to email or text the waypoint information to use on the boat. You can create free FishTrack widgets to display SST data right on your own website. This is great for our charter captain partners, marinas and fishing clubs. Simply click the “Create Widget” link at the top of the page when viewing any FishTrack region, and you’ll be given the code to paste into your site’s HTML. FishTrack widgets offer Cloudfree SST, marine forecasts and wind and swell forecasts.